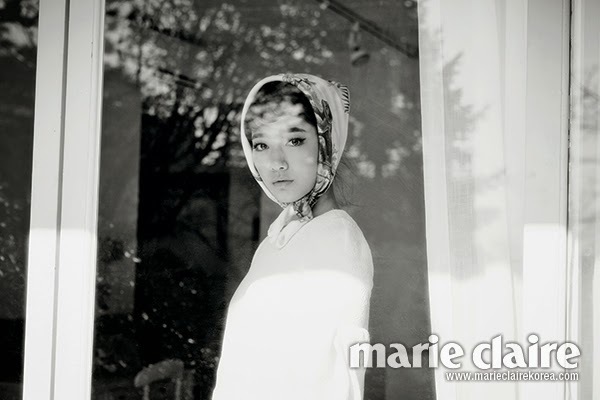 Want to know what designer clothes Shin Hye wore for Marie Claire Korea? 머리에 두른 실크 스카프 에르메스(Hermes), 퍼프소매 화이트 원피스 질 스튜어트(Jill Stuart). Hermes Silk scarf, Jill Stuart white one piece with puff sleeves. Hermes scarf, H&M light pink full skirt, Repetto black patent shoes, pearl earrings and white shirt from stylist, bike from Vite by Bike Factory. 블랙 니트 스웨터 에이치앤엠 컬렉션(H&M Collection), 블랙 팬츠 마쥬(Maje), 진주 귀고리 스타일리스트 소장품, 티 세트 파넬(Parnell), 클래식한 패턴의 러그 이튼 알렌(Ethan Allen). H&M Collection black knit sweater, Maje black pants, Parnell t-shirt, pearl earrings from stylist, Ethan Allen Classic rug. 블랙 하이넥 스웨터와 아이보리 샤 스커트, 토슈즈 모두 레페토(Repetto). Repetto black high neck sweater, ivory skirt and toe shoes. Salvatore Ferregamo gold silk dress, Stuart Weitzman gold satin pumps, pearl earrings and black clutch from stylist; Ethan Allen floral patterned sofa and classic rug. 위 부터) 블랙 하이넥 스웨터 레페토(Repetto), 진주 귀고리 스타일리스트 소장품. 블랙 니트 스웨터 에이치앤엠 컬렉션(H&M Collection), 화이트 테이블, 러그 모두 이튼 알렌(Ethan Allen). 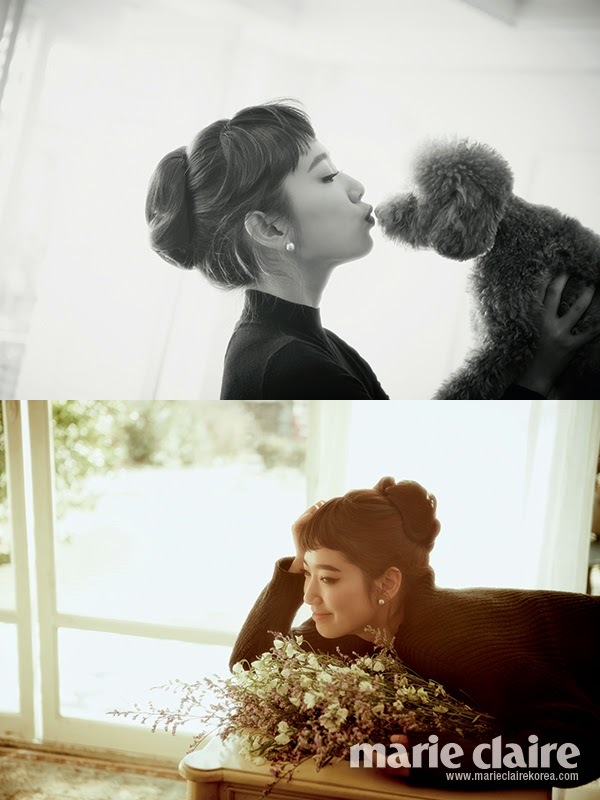 Top photo: Repetto black high neck sweater, pearl earrings from stylist. Bottom photo: H&M Collection black knit sweater, Ethan Allen white table and rug. Demin classic jacket, The Izzat Collection slit detailed H line skirt, Dior stillettos; pearl earrings; hat and black belt from stylist.